Lumineers® are a widely-marketed brand of porcelain veneers that are advertised as being ultra thin, yet strong, requiring little to no preparation of your natural teeth before they are placed, and being placed in as few as two visits. How do they compare to other brands? 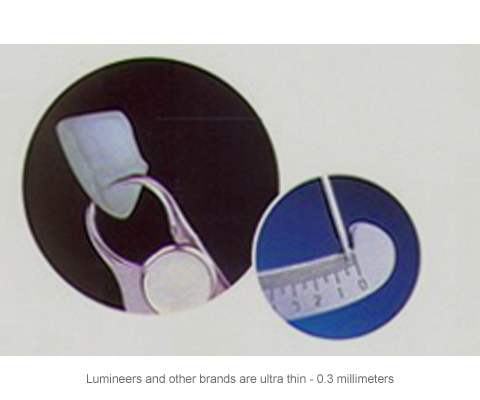 Lumineers are only 0.3 millimeters thick, but there are other brands that are equally thin and strong. Also, placing veneers in as few as two visits is common. Although this and other brands can be placed without preparation of your teeth, at times, no preparation can cause the veneers to look bulky or too long. Many skilled cosmetic dentists criticize the laboratory at DenMat, which makes Lumineers, because the veneers often look pasty or bulky. Dr. Miranda Lacy is very familiar with Lumineers, but she prefers other brands, with which she and her master ceramist create customized smile designs. Read about her beautiful smile guarantee. If you have questions or would like to find out if you are a candidate for porcelain veneers, request an appointment online or call us to schedule an appointment.